World Ballet Day LIVE 2017 returns Thursday, October 5. 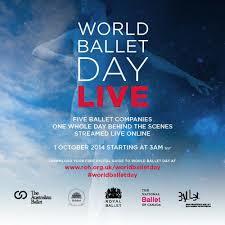 The Australian Ballet, Bolshoi Ballet, The Royal Ballet, The National Ballet of Canada, and San Francisco Ballet unite once again, with the whole event streamed LIVE http://worldballetday.com/. All five companies invite a wide range of regional dance organizations geographically close to their location to be part of World Ballet Day LIVE. This year the following companies will join us as part of the 22 hours live stream; The National Ballet of Japan, Singapore Dance Theatre, The National Ballet of China, Ballets du Monte Carlo, Birmingham Royal Ballet, English National Ballet, Scottish Ballet, Northern Ballet, Houston Ballet and Ballet West.